Felt Removal – Should the old felt underlayment be removed (black felt removal) when the new roof is installed or not? That’s a question I get quite a bit, and the answer is, “No.” The old felt can’t be relied upon to shed water since it has nail holes and tears in it from the shingle removal, so without question, you need new asphalt felt paper. Old roofing felt tar paper serves no purpose, and only makes the job site harder to keep clean. But what about inspecting the deck or roof sheathing for rotten wood? That’s a very important step in the re-roofing process, too. When the old shingles are torn off, nails pull thru most of the time, and stick up the thickness of the shingle they were nailed through. 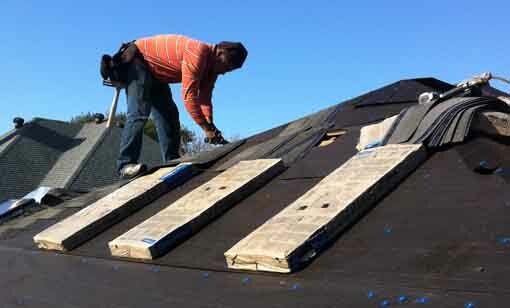 In order to prevent new tar paper from being torn by these nails, Texas Star professionals go over the entire roof and hammer in the nails so that they are flush with the decking. If you’ve ever struck a rotten piece of plywood with a hammer, you know it reacts totally different than good, solid wood. Since nails are approximately six inches apart and staggered going up the roof, we cover the entire roof with our inspection. If we discover rotten decking, we tear off the felt between the plywood and roofing shingles in that area to determine exactly what needs to be replaced. It is very important to inspect the decking and replace anything that will not properly hold a nail. Wood that will not hold a nail results in blown off shingles. If you look at the roof deck from the attic side, you will sometimes see water stains where your roof has leaked in the past. Don’t worry, those stains pose no problem, as the integrity of the wood has unlikely been compromised. The professional crews at Texas Star Roofing are trained to look for bad wood, and they have an incentive to find it. Our company holds crews responsible for their labor in our warranty, and they have to do any repairs at no charge when there is a problem. We also compensate them for the labor involved in replacing bad plywood. Want to know whether you need roof repairs or a new roof, and if so, how much it would cost? Texas Star offers free roofing inspections & felt removal in the Dallas/Ft. Worth area. To request our professional services, complete the form on your right to schedule a free, no-obligation inspection.